There’s no doubt that 2012 has been a year for the weather record books. There have been scorching temperatures, huge tornado outbreaks, damaging straight line winds— and then Hurricane Sandy. Throughout it all, we have received only one report of ‘damage’ to a RHINO metal building: the little RHINO sign on the peak of a metal barn came off! The happy customer graciously contacted us to let us know how pleased he was with the performance of his RHINO steel building. Joe purchased a 65’ x 80’ prefabricated metal building from us in 2009 to use as an equipment shelter on his Virginia farm. A savage heat wave battered the area in June, with temperatures soaring into the triple digits all across the Northeastern and Midwestern U.S. These hot, humid conditions spawned a devastating derecho. Virginia experienced some powerful thunderstorms on Monday, July 25, 2012, which early reports were calling a “derecho.” Later the National Weather Service corrected that statement, determining that the damage from the storm did not quite fit the criteria for a derecho. A Freakish Super-Derecho Screeches across the U.S.
Then on Friday night, June 29 and Saturday morning, June 30, Virginians saw a true derecho as the monster storm raced from Illinois to the Atlantic, moving at speeds of 60-70 mph. Wind gusts were clocked at 91 mph, but a weather service spokesperson claimed the damage from the storm indicated the gusts could have been as high as 100 mph in some places. That’s comparable in wind gust speeds to an EF-1 tornado or a high-end category 1 hurricane. In all, 22 people were killed by the storm, 15 of them in Virginia. Damage was widespread. As many as 3.7 million people were without power in the midst of the stifling heat wave. Hundreds of trees were uprooted or snapped off. Roofs were damaged or torn away. Cars and structures were crushed by falling trees. Siding was ripped from houses. Airplanes were flipped over. Many barns and garages were destroyed. Yet the only damage suffered by Joe’s RHINO metal building was that his peak sign blew away. However, when Joe contacted RHINO to tell us how well his building weathered the derecho, none of us suspected that there was another test to come. After grueling, sweltering days without electric power in the aftermath of the derecho, Virginians all too soon found themselves shivering in the dark as the monstrous “Frankenstorm” named Hurricane Sandy slammed into the U.S. on October 29, 2012. Sandy crashed into the U.S. with incredible ferociousness. The sheer size of Hurricane Sandy made the devastation extensive. Sandy was a whopping 820 miles in diameter. The “perfect storm” brought havoc and heartbreak, as it meted out punishing amounts of rain, storm surge, high winds, hail, and snow over seventeen states. In parts of Virginia, Hurricane Sandy dumped as much as 24” of snow. Blizzard conditions prevailed over much of the western half of the Old Dominion. According to Robert McDonnell, the governor of Virginia, the eastern part of the commonwealth also suffered torrential rain, while there was severe flooding along the coastal areas. RHINO ships strong pre-engineered metal buildings to all 50 states, Canada, and Mexico, from multiple shipping points. Our durable steel framing is guaranteed to meet or exceed all local building codes for the lifetime of the building. Let us know how we can serve your aviation, commercial, agricultural, industrial, or storage metal building needs. Call RHINO Steel Building Systems today at 940.383.9566. 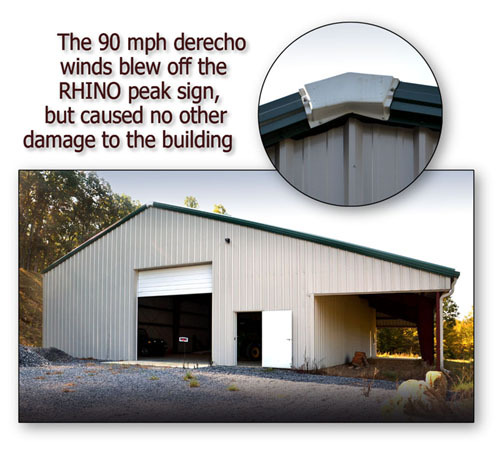 Share the post "RHINO Metal Building Survives Derecho and Hurricane Sandy"